Ovation Brands’ portfolio of restaurants – Old Country Buffet, Ryan’s, Hometown Buffet, Country Buffet – and Furr’s Fresh Buffet are rolling out a new Family Night promotion featuring the popular children’s books, Dork Diaries. 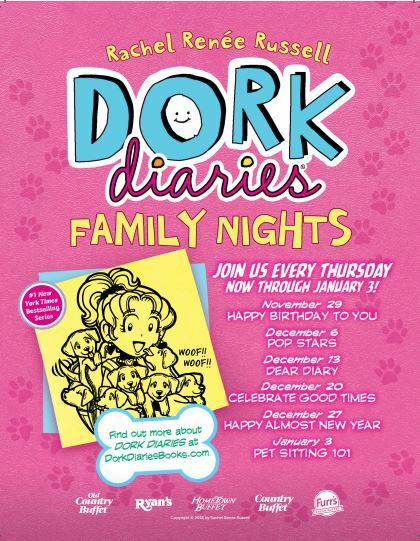 Dork Diaries is a humorous children’s book series written and illustrated by Rachel Renée Russell. The series, written in a diary format, uses drawings, doodles, and comic strips to chronicle the daily life of its 14-year-old protagonist, Nikki Maxwell, in and outside of middle school. Each Thursday, from November 29th through January 3rd, between 5 p.m. and 8 p.m., kids may participate in different interactive and educational activities in Ovation Brands’ restaurants and Furr’s Fresh Buffet locations. PLUS kids eat for $1.99 from 4 p.m. to close with the purchase of a regular-priced adult or senior meal. November 29 – Happy Birthday To YouDecember 6 – Rock On!December 13 – Dear, DiaryDecember 20 – Celebrate Good TimesDecember 27 – Happy Almost New YearJanuary 3 – Pet Sitting 101WIN!